Diodorus Siculus (/ˌdaɪəˈdɔːrəs ˈsɪkjʊləs/; Greek: Διόδωρος Σικελιώτης Diodoros Sikeliotes) (fl. 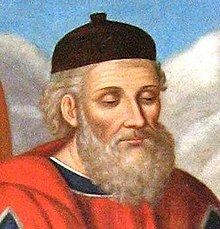 1st century BC) or Diodorus of Sicily was a Greek historian. He is known for writing the monumental universal history Bibliotheca historica, much of which survives, between 60 and 30 BC. It is arranged in three parts. The first covers mythic history up to the destruction of Troy, arranged geographically, describing regions around the world from Egypt, India and Arabia to Europe. The second covers the Trojan War to the death of Alexander the Great. The third covers the period to about 60 BC. Bibliotheca, meaning 'library', acknowledges that he was drawing on the work of many other authors.